Consumers may incorrectly estimate the amount of alcohol in drinks such as premium light beers, flavored hard ciders, malt beverage coolers and craft beers, the Public Health Institute’s Alcohol Research Group says. “A one or two percentage point difference in alcohol content between beer brands may not sound like much, but proportionally it’s pretty big and the difference adds up over a number of drinks,” said the report’s lead scientist, William Kerr. A federal law that requires alcohol manufacturers to list the alcohol content by volume on their products’ labels is optional for beer and wine makers, according to the San Francisco Chronicle. “A lot of the wines now are 14 percent or even 15 percent commonly, and the standard 5-ounce glass of wine doesn’t apply to that level,” Kerr told HealthDay. “Really a 4-ounce glass is more appropriate. And we’ve learned from our studies of bars and restaurants that the average glass is a little bit over 6 ounces.” He noted one glass of wine may actually contain about 50 percent more alcohol than a person expects. Individual drinking habits may be found on a continuum from responsible drinking through alcohol abuse to alcoholism, or physical dependence. There are many signs that may point to an alcohol problem. Drunkenness on its own or solitary drinking does not necessarily indicate alcoholism. The questionnaire will be meaningful to you only if you are honest with yourself when taking it. The important question is: Is your use of alcohol creating significant negative consequences in your life? Do you sometimes drink heavily after a setback or an argument, or when you receive a poor grade? When you experience trouble or are undergoing stress, do you always drink more heavily than usual? Can you handle more liquor now than you could when you first began drinking? Have you ever awakened the “morning after” and found that you could not remember part of the evening before, even though your friends said that you didn’t pass out? When drinking with others, do you try to have just a few additional drinks when they won’t know of it? Are there times when you feel uncomfortable if alcohol isn’t available? Have you noticed lately that when you start drinking you’re in more of a hurry to get to the first drink than you used to be? Do you sometimes have negative thoughts or feelings about your drinking? Are you secretly irritated when your friends or family discuss your drinking? Do you often want to keep drinking after your friends have said that they’ve had enough? When you’re sober, do you often regret things you have done or said while drinking? Have you often failed to keep promises you have made to yourself about controlling or cutting down on your drinking? Do you try to avoid your girlfriend/boyfriend when you are drinking? Are you having an increasing number of school, work, or financial problems? Do you eat very little or irregularly when you’re drinking? Do you sometimes have the “shakes” in the morning and find that it helps to have a drink? Have you noticed lately that you cannot drink as much as you once did? If you can answer “yes” to several of these questions, your drinking is causing problems for you and professional consultation can help prevent problems from getting more intense or numerous. Additionally you may find help at Alcoholics Anonymous. Some people resolve to curb their drinking and can do so for a time only to have their alcohol problems persist or reoccur. The drinking habits of alcohol abuse or alcoholism can become very entrenched. People are living longer and are generally healthier. This means that seniors are making up a larger portion of our population. Although alcohol use typically declines with age, some seniors may be at risk for alcohol-related problems. What Makes Alcohol an Issue for Seniors? Alcohol has a greater effect on seniors because metabolism changes as we age. Older people are more sensitive to the effects of alcohol, and a little will go a long way. Seniors generally take more medications than other adults. Mixing alcohol with either prescription or over-the-counter drugs is unwise and can be dangerous. 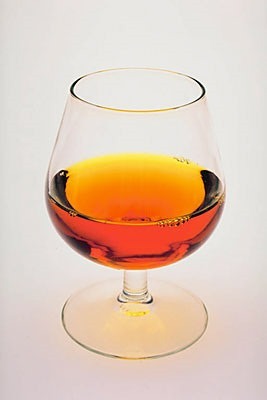 The development of age-related health problems can cause anxiety and drinking may help some people feel more relaxed. At the same time, chronic conditions such as heart disease or decreased mobility can be aggravated by alcohol use. Loss of a spouse, friends, home, or career often occurs in later years. Alcohol may be used to deal with these and other emotional stresses. 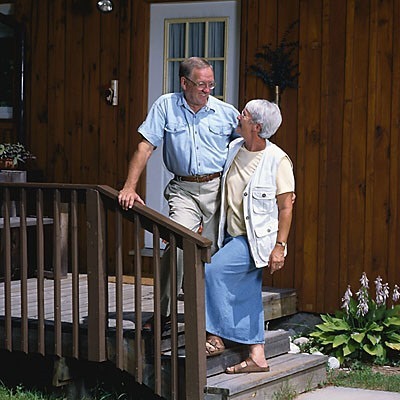 Retirement brings long stretches of leisure time and may result in feelings of loneliness and depression. Alcohol may assume a role in helping pass the time. Alcohol problems among older persons are often mistaken for physical, social or emotional conditions associated with aging. The abuse or misuse of alcohol may go undetected or may be treated inappropriately. For some seniors, lack of day-to-day contact with fellow workers, families, and neighbors can make it difficult for others to detect an alcohol problem if one exists. Older people who have lived through many life experiences often pride themselves on being able to handle their problems without the help of outsiders. They may be unwilling to admit to a drinking problem or uncomfortable seeking help. In general, alcohol problems among older people can be divided into three categories. Some seniors have used alcohol excessively throughout most of their lives. Others drink at low levels but are inadvertently mixing alcohol with other drugs in ways that are harmful. And some people begin to use alcohol for the first time in their later years. Throughout our lives it makes sense to spend our time wisely and enjoy the best health possible. Seniors can choose healthier alternatives to alcohol use – exercise, a second career, hobbies, or professional counseling to help deal with grief and loneliness. 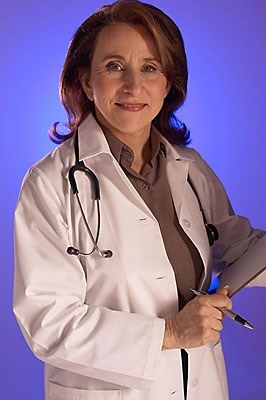 Getting to know your doctor and pharmacist is also a good idea. These health professionals will have answers about alcohol and other drug use. Young or old, it is important to ask for help when needed. Information and treatment services are available in your area. The study included 740 people considered hazardous and harmful drinkers, defined as men who had more than 14 drinks a week, or more than four drinks at a time, and women who had more than seven drinks a week, or more than three at a time. They were divided into three groups. One group received brief counseling aimed at limiting alcohol consumption, the second group received the counseling plus a follow-up phone call, and the third received standard care alone. Health Day reports patients who received the counseling reduced their average number of drinks from almost 20 a week to 13 a week within six months. One year later, they drank slightly more than 14 drinks a week. “So many of the tragedies we see in the emergency department are due to problem drinking. Our study shows that brief counseling of patients can improve outcomes and have a life-saving impact,” lead researcher Gail D’Onofrio of the Yale University School of Medicine said in a news release. A new study finds that alcohol consumption cost the United States $223.5 billion in 2006, or about $1.90 per drink. Excessive alcohol consumption is known to kill about 79,000 people in the United States each year, but a new study released by the CDC and The Lewin Group shows that it also has a huge impact on our wallets as well. The cost of alcohol consumption in the United States reached $223.5 billion in 2006 or about $1.90 per drink. 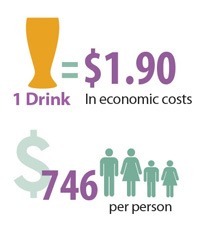 Almost three-quarters of these costs were due to binge drinking. 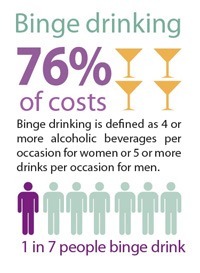 Binge drinking is defined as consuming four or more alcoholic beverages per occasion for women or five or more drinks per occasion for men, and is the most common form of excessive alcohol consumption in the United States. The researchers found that the cost of excessive drinking was quite far-reaching, reflecting the effect this dangerous behavior has on many aspects of the drinker’s life and on the lives of those around them. The costs largely resulted from losses in workplace productivity (72% of the total cost), health care expenses for problems caused by excessive drinking (11% of total), law enforcement and other criminal justice expenses related to excessive alcohol consumption (9% of total), and motor vehicle crash costs from impaired driving (6% of the total). The study analyzed national data from multiple sources to estimate the costs due to excessive drinking in 2006, the most recent year for which data were available. The study did not consider a number of other costs such as those because of pain and suffering among either the excessive drinker or others that were affected by their drinking, and thus may be an underestimate. The researchers estimated that excessive drinking cost $746 for every man, woman, and child in the United States. in 2006. Researchers said the findings have profound significance for older people –a population that is aging worldwide at an unprecedented rate and that includes Baby Boomers as they become senior citizens. Findings were presented at the Research Society of Alcoholism conference in San Francisco. Also conducting research in the study was Adelle Novier, a doctoral student in psychology and neuroscience at Baylor. Why can some people have a glass of wine or beer with their meal without feeling compelled to drink more, whereas others can’t seem to stop drinking? Can some people “hold” their liquor better than others? Does alcoholism tend to run in families? Does genetics hold the key to developing medications to treat alcoholism and its effects on the body? Researchers have been trying to find answers to questions such as these for several decades, seeking to identify the factors that influence a person’s risk of becoming alcohol dependent. Research, to date, indicates that both your genetic makeup (i.e., the information stored in the DNA that you inherited from your parents) and your environment (i.e., how you live) influence your risk for alcohol abuse and alcoholism. Your genes certainly play an important role, influencing how your body responds to alcohol, how sensitive you are to its effects, and how likely you are to have a problem with alcohol. However, environmental factors—such as being surrounded by people who are heavy drinkers and who encourage you to drink—also can raise your risk for drinking too much. The next question then becomes just how much of this risk is determined by our genes—that is, how much can be attributed to factors beyond our control. By studying large families with alcoholic and non-alcoholic members, comparing identical and fraternal twins, and studying adopted children and their biological and adoptive families, researchers found that about half of our risk for alcoholism is influenced by genetics. The remaining risk is related to the influence of environment—where and how we live. The two factors also work together in complex ways. Unlike for some other diseases, there is no single gene that determines whether you will develop a problem with alcohol; instead, many genes influence your risk for developing alcoholism, each of which only has a small impact. Understanding how genetics influences alcoholism also is important for another reason. Knowing the genes involved in this disease could help researchers and clinicians identify those who are most at risk of becoming alcoholic and understand how alcohol affects the body. These individuals then could be targeted more effectively for prevention and treatment efforts. This Alcohol Alert describes how research is helping to identify the genes involved in alcoholism. In examining this research, one thing becomes clear: Unlike for some other diseases, there is no single gene that determines whether you will develop a problem with alcohol; instead, many genes influence your risk for developing alcoholism, each of which only has a small impact. Further, environmental influences may override or blunt the effects of the genes that increase risk. This overview describes how researchers are trying to tease apart which of the thousands of genes and millions of gene variants that make up your DNA play a role in alcoholism, how some of these genes act, and how these genes interact with your environment to determine how you and your body respond to alcohol. As described above, researchers are learning more and more about how your genetic makeup can influence your drinking behavior and its consequences and which genes may put you at increased risk of alcoholism. But does this mean that if you inherit a certain combination of genes from your parents, you are destined to become an alcoholic? The answer to this is a clear “no” because how you live also plays an important role. People with the same genetic makeup may be more or less likely to develop alcoholism depending on their environment and life circumstances. Researchers can study the interactions between genes and the environment and the relative impact of each through a variety of direct and indirect approaches.38 These approaches have helped identify several environmental factors that either protect us from or place us at increased risk for alcoholism; for example, marital status and religiosity have been found to be protective factors, lessening the impact of genetic risk factors on drinking in women. For adolescents in particular, drinking seems to be influenced strongly by environmental factors in addition to genetic makeup. 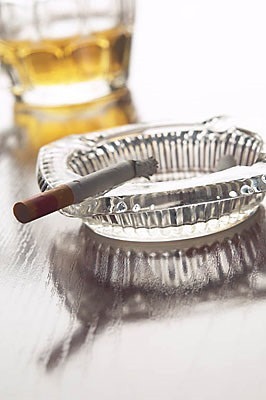 Adolescents who carry high-risk genes and whose parents do not monitor their activities and/or who have friends that use alcohol and other drugs are more likely to develop alcohol problems than those with a similar genetic makeup whose behavior is monitored more closely. Modifying the environment also can help adolescents avoid risky drinking behavior. Participants in one prevention program designed for youth were less likely to engage in high-risk behavior, such as drinking, even though they had a high-risk genetic background. The bottom line is that genes alone do not determine our destiny—lifestyle choices and other environmental factors have a substantial impact. In addition, many other individual and psychosocial variables influence when and how much we drink, both in the short and long term, and how this influences our risk of alcoholism.